Confusingly, Motorola has taken the name from last year’s flagship phone and used it again for this year’s model: it’s just called the “Moto X.” That’s a shame, because this year’s version is a big improvement. The new Moto X is blazing fast, smartly designed, and strikes just the right balance between stock Android and custom software. It deserves a name that lets customers know that it's a big step up from last year's model. In fact, if it weren’t for a slightly smallish battery and a middle-of-the-road camera, it would easily take the crown for the best Android phone this year. The old Moto X had a 4.7-inch 720p display and a Snapdragon S4 Pro processor—barely a step up from all those mid-range phones that cost about $300 off contract. It was fast enough, but it wasn’t going to win over any enthusiasts. The new Moto X finally delivers powerful hardware worthy of a company flagship phone. The display has bumped up to a 5.2-inch 1080p AMOLED that is bright and easy to see outdoors, though the colors are a little over-vibrant. Some phones are moving to higher-res 2K displays, but that’s a waste. The 424 pixels per inch (PPI) of a 1080p display is perfect for a modern smartphone, and strikes a nice balance between razor-sharp clarity and battery life. Motorola has left you no excuse to pick a phone with a better processor. The 2.5GHz Snapdragon 801 in the new Moto X is the same you’ll find in the other top-tier phones. It’s got 2GB of RAM, and while some phones are moving up to 3GB, you won’t notice the difference. This thing flies. Every menu pops up instantly, every screen scrolls smoothly. Motorola has done some great software optimization work, and the result is a phone that feels like it’s locked at a solid 60 frames per second rate in nearly everything you do. Just look at those benchmarks! 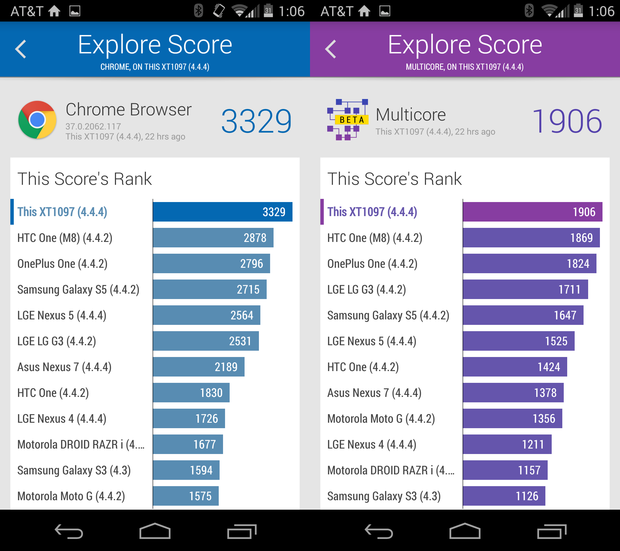 Benchmarks aren’t everything, but the new Moto X was consistently among the top performers in every test I ran. More importantly, it feels fast. The only place where the basic specs let me down in Motorola’s decision to include only a 2300mAh battery. 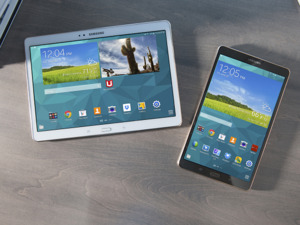 Last year’s model had a 2200mAh battery, but that was driving a smaller, lower-res display. The company claims that the display is more energy efficient this time around, and that it has done a lot of tweaking to get better battery life, but I’d still like to see a bigger battery in there. In our HD video playback test, the phone died in just under 9 hours. That’s not bad, but there are phones that last longer. I had no trouble at all getting through a full day of somewhat heavy use, so the battery shouldn’t be a big problem. Motorola sells an optional $40 Turbo Charger that supports Qualcomm’s Quick Charge 2.0 technology. It says you can get 8 hours of use from 15 minutes of charging. I didn’t have the opportunity to test this out, but even the basic charger included in the box filled up a near-dead battery to about 60% in one hour. Last year’s Moto X introduced a truly customizable smartphone; just head to the Moto Maker site and order a phone with the front color, back color, and accent color you like. You could choose from several wooden finish backs. Motorola’s not giving up on the idea. The new phone will be available at the Moto Maker site later this month, again in loads of colors and materials. 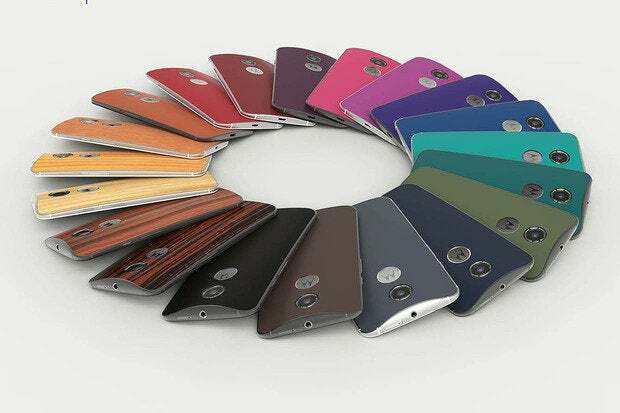 You can order your Moto X in a wide variety of colors and materials. You can pick a white or back front, 25 different backs (17 colors, 4 real wood grains, and 4 styles of leather), 10 accent colors, and optional engraving. Plus, of course, you can pre-load custom wallpapers to match your choices. Our review unit is white with a bamboo back—not the combination I would choose for myself. It’s wonderful to make a phone look the way you want without resorting to a bulky case, but it’s more important that the core design looks and feels great. Despite the move to a larger screen, the 2014 model retains a nicely curved back that makes it easy to hold. The metal rim (which doubles as an antenna) gives the handset a classy look. The seams are tighter than in last year's model, and the phone doesn’t flex at all. It feels dense, solid, durable, and comfortable. It may look like the phone has stereo speakers, one above the display and one below, but it doesn’t. That upper speaker grill is just for the phone earpiece; all other sound comes from a single speaker near the bottom. That’s a bummer, because this is otherwise one of the best speakers I’ve ever heard in a phone. It gets extraordinarily loud. Uncomfortably loud. Speakerphone-from-across-the-room loud. You might be worried that a 5.2-inch display has made the phone too large. Don’t sweat it. Yes, it’s a lot bigger than the old Moto X, but the bezels are thin, there’s not a lot of extra material above and below the display, and the smoothly curved back makes the phone feel smaller than it is. I can put it in my front pocket and still sit down comfortably, and I can hold and operate it with one hand. Granted, my hands are large, but this phone is a lot easier to manage than, say, the HTC One (M8). Yes, the new Moto X is a lot bigger than the old one, but it still feels great in the hand, fits in your pocket, and is easy to use. The power button and volume rocker are on the right side, in easy reach of your thumb, and they’re perfect. They stick up just enough to operate accurately without looking, and require just enough pressure that you won’t activate them accidentally. Motorola deserves praise for developing a phone that feels better in my hand than any Android phone I’ve held in the last couple years. If you’re really into taking tons of pictures with your phone, and you’re a stickler for quality, get ready for disappointment. Motorola has dropped the Omnivision sensor in last year’s model and opted instead for a Sony IMX135 13-megapixel sensor with an f/2.25 aperture lens. This is the same sensor you’ll find in a lot of other phones, from the Galaxy S4 to the LG G3 and Galaxy Note 3, but the photos you get from it are remarkably average. 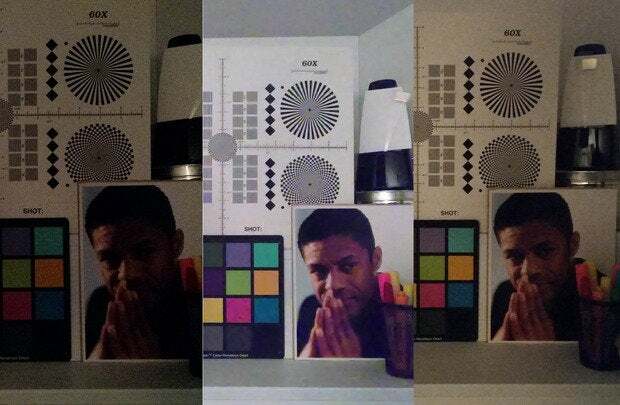 In low light, the images are simply too dark and full of noise. 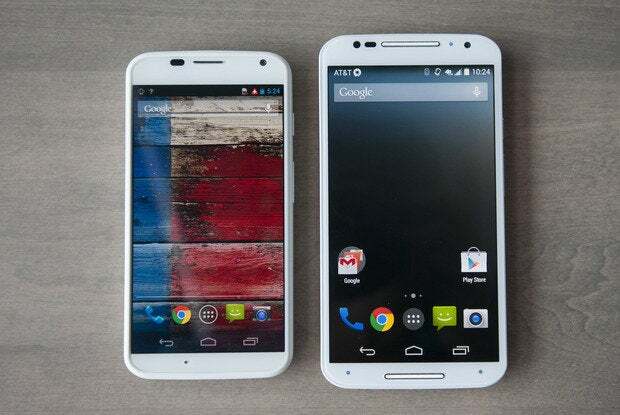 The new Moto X (left) is a dark and noisy mess is low light, especially compared to last year’s model (center). The Galaxy S5 (right) is dark, but not as noisy. The dual-LED “ring flash” does a decent job of lighting up dark scenes without creating horrible shadows, but the color tone is a little too cool, and there’s still too much noise in the image. The same dark scene as above, this time with the flash enabled. The new Moto X (left) fares much better than the old Moto X (center) or even the Galaxy S5 (right). 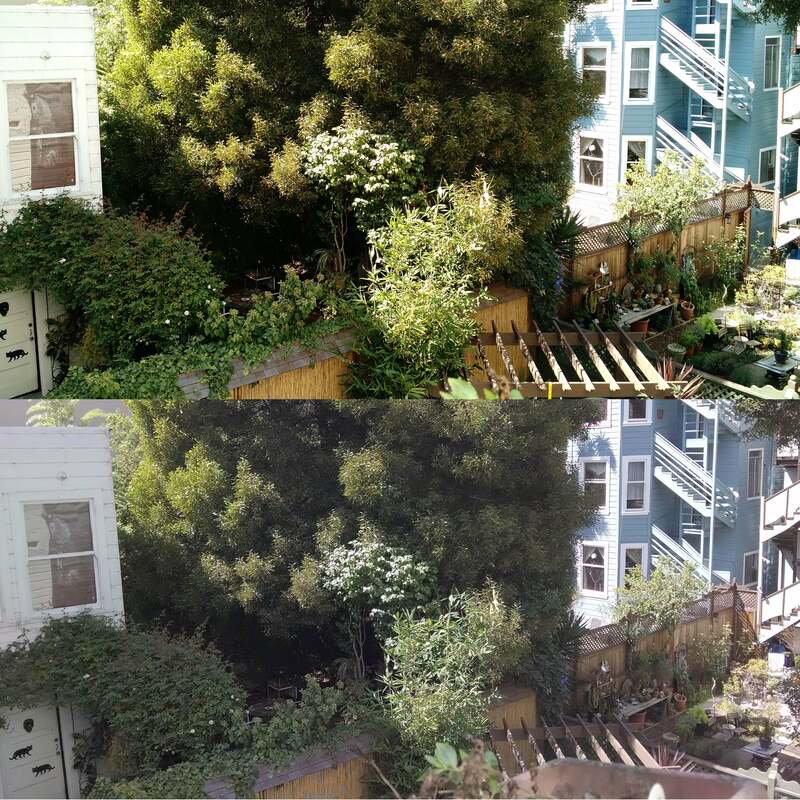 Taking photos outdoors during the day produces better results. Not only do you get more resolution than with last year’s phone, but the colors are more vibrant and true-to-life. 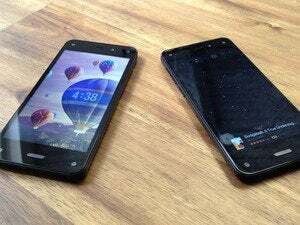 The improvement over the old Moto X is substantial, but again, there's noise where there should be none. Daylight photos have better color when shooting with the new moto X (top) compared the old model (bottom). If you demand the very best photos from your phone, you’ll be disappointed by the new Moto X. The shots I took over several days of use were average at best, and I was never once surprised by a photo that came out better than expected. With any luck, we’ll see some big improvements when the phone is updated to Android L, which brings with it some big under-the-hood changes to how the Android system handles camera sensors. Really into selfies? Sadly, Motorola didn’t get the memo: taking photos with the front-facing camera is a big deal now, and these 2.1 megapixel shooters optimized for video chat aren’t going to cut it. You want a 5 megapixel front-facing camera, like that in the HTC One (M8). At least the camera software is simple, easy to use, and effective. The “twist the phone twice to launch straight into the camera” gesture makes a return from the original Moto X, and seems more reliable. Once inside the camera app, swipe left for a simple dial menu of camera options (HDR, flash, resolution, and so on), swipe right to view the gallery, and just tap the screen to take a photo. The camera interface is fast and simple, but lacks the flexibility found in many other high-end phones. The camera is dramatically faster than before; it snaps off photos with lightning speed. And a new burst mode (just hold down on the display) can fire off lots of shots in a hurry. Video recording is simple: just tap the video icon and you’re recording. The camera shoots 4K and slow-mo video; par for the course in today’s flagship phones. 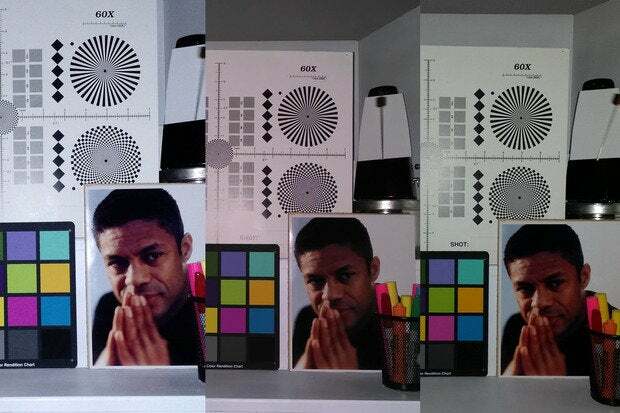 I’m a fan of the simple camera interface, but photography nerds will be disappointed by the lack of options and extras. Some sort of “expert mode” to give you a little more control would be a great idea. Look, there’s nothing inherently wrong with the those heavy manufacturer customizations layered on top of Android. I’ll even go so far as to say I like HTC's Sense 6. They’re just needlessly heavy-handed. Everyone has to make the whole phone look and work in their own way. Menus are reorganized and rearranged, the notification panel is totally different, and there’s no way to tell where custom apps end and interface enhancements begin. There’s a better way. Don’t change the way everything looks, just add smart functions through apps that can be updated through the Play store. This is the path Motorola takes. The Moto X looks and feels like stock Android, but it does some additional clever tricks in a simple and unobtrusive way. Most of Motorola’s software enhancements are built around letting you do more with your phone when you’re not holding it in your hands. Moto Display pulses the display to show the time and small notification icons. Tap and hold on the screen to get a preview of the notification without even unlocking your phone, and drag up to the notification icon to wake the phone up and go right to that app. It works great, and once you get used to seeing your notifications this way, you can never go back to a simple blinking LED. Moto Display lets you see your notifications without unlocking or waking your phone. 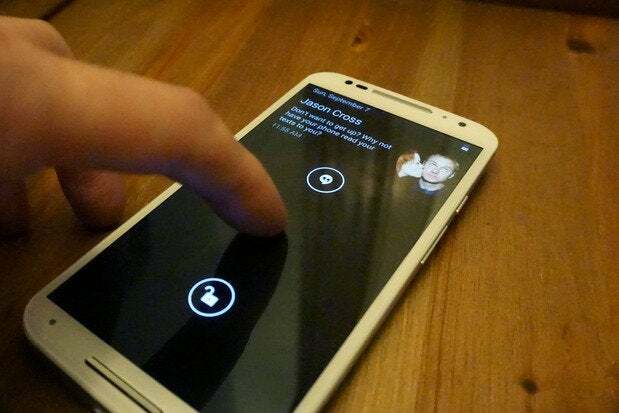 Moto Voice lets you talk to you phone. Yeah, I know, you’re thinking Google Now already does that. And you’re right—in fact, many of the commands you give Moto Voice simply hand off to Google Now to complete the action. But this is something more. First, you can change the key phrase to anything you want as long as it has around 4 or 5 syllables. If you want to say “Listen up, smartphone!” instead of “OK Google,” you can do that. More importantly, the Moto X is always listening, even when it’s asleep. Get up in the morning, say your key phrase, and then “what’s up?” and the phone will give you a digest of your daily life—the weather for today, missed notifications and text messages, and your next meeting. 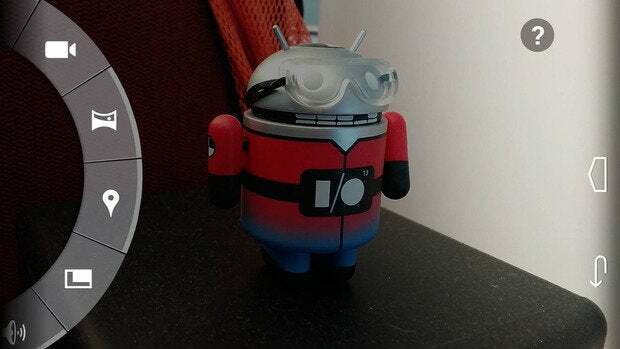 All the Google Now commands work, but Motorola has added a few more useful phrases. Moto Assist is a set of features designed to make your phone behave better depending on what you’re doing. The Moto X can silence itself during your meetings or when you’re asleep. If it detects that you’re driving, it can read text messages aloud, and automatically connect to your car’s Bluetooth system to play music. When you're at home the phone can read your text messages aloud and speak the name of a person calling you, so you can use your phone while it sits plugged in across the room. These features work really well, and are surprisingly battery-friendly. The display, being OLED, only lights up those pixels necessary for the brief notifications, and Motorola uses coprocessors to process audio for the phones always-listening function. I used Moto Voice, Assist, and Display all day every day, and never had to charge up until I was ready to hit my pillow at night. Slightly less useful, but still sort of neat, are the infrared sensors located in the front of the phone. They’re used to detect a simple gesture: waving your hand over the phone while it’s resting on a table. This shows the Moto Display notifications, and when the phone’s ringing, it silences the ringer. 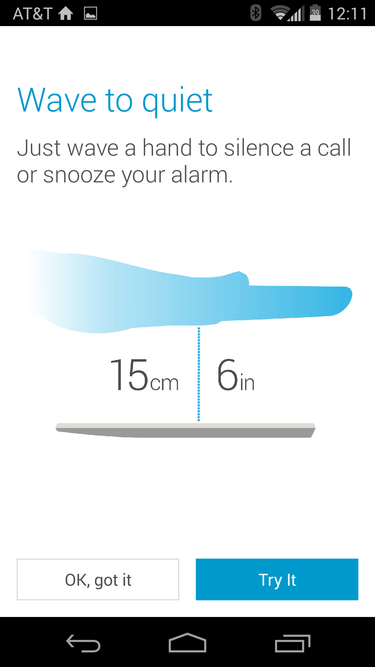 If your alarm is going off, this simple wave gesture is like hitting the snooze button. These sensors are also supposed to make the “know when I’m looking at the screen and don’t put it to sleep” function more reliable. I guess it works, because even with a short display timeout set, the screen never turned off while I was staring at the phone. Wave your hand over the phone to snooze alarms, silence incoming calls, or take a peek at notifications. Motorola has done a great job of supporting its phones with rapid Android updates, perhaps because they don’t dramatically change the whole interface. 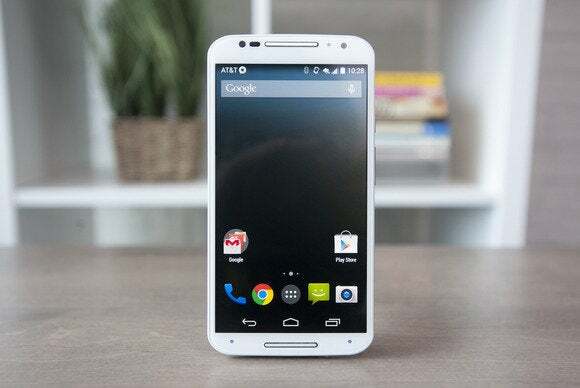 If you want a phone that will get Android L before most of the others, the Moto X is a safe bet. It’s no secret that Motorola has fallen far from those lofty days when everyone had a StarTAC or Razr in their pocket. It has taken the company quite awhile to really figure out the smartphone market. Last year's Moto X wanted to be considered a flagship phone, but it had “one step down” hardware that simply felt like a compromise compared to the HTC One (M7) or Galaxy S4. This year is different. This phone is what you expect a flagship phone to be. It’s exquisitely engineered. It’s got the latest hardware, tuned to offer blazing performance. It’s endlessly customizable. And best of all, it offers smart, targeted software features that build neatly on top of Android without upending the whole Android user experience. It’s a shame the camera is only average, because that’s really the only thing holding this back from being the hands-down best Android phone of the year. If you can get by with a phone that doesn’t have the best possible camera, the new Moto X should be on your short list. If this is what Motorola is capable of, I can’t wait to see what’s next. 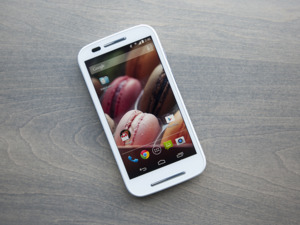 The new Moto X fixes nearly everything wrong with last year's model. It's bigger (but not too big), faster, smarter, and better-built. This is one of the best Android phones you can buy.